Are Government Bonds The Bubble Of Last Resort? Having lived through two market crashes in less than two decades, the return to high stock market prices last year convinced some market bears that we were already seeing the next bubble start to form. In their annual survey of long-term asset returns, Deutsche Bank strategists Jim Reid, Nick Burns, and Seb Barker argue that the bears have the right idea but are looking in the wrong place – the next bubble is in government bonds, which means that it isn’t likely to burst soon, but the consequences would be severe if it ever does. Looking at the recent history of asset bubbles, Reid, Burns and Barker point to the Asian crisis of 1997 and the Russian and LTCM crises the following year as the beginning of a cycle of collapse followed by strong intervention, pushing excesses from one part of the economy to another with the stock market crash in 2000, the housing collapse in 2007-2008, and the Euro debt crisis each taking its turn. The result has been not just the lowest yields in living memory, but in most cases the lowest yields since markets came together. The longest historical record we have is in the Netherlands where yields are now at a 500 year low. 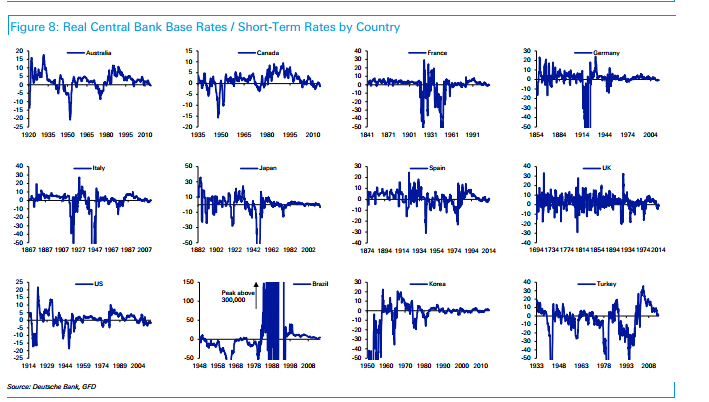 The same is true in most developed economies, but the Deutsche Bank report points out that real yields (nominal yields minus inflation) paint a less extreme picture. Real government bond yields are still in bottom 40% in developed markets, and typically in the bottom quartile, but they’re still a ways from all-data lows. 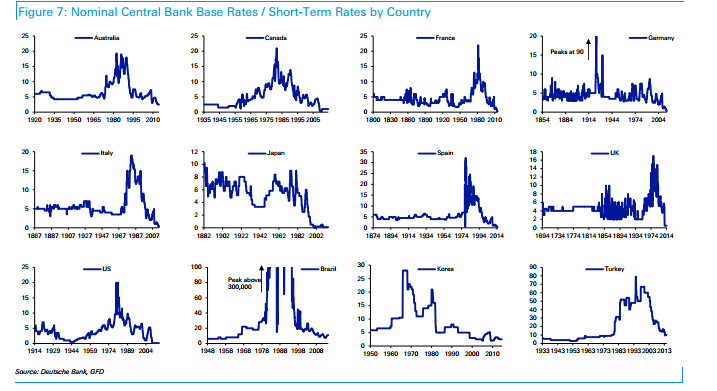 Similarly, nominal base rates are at all-data lows in the developed world, while real base rates are consistently depressed but only in the lower 20% in a handful of countries. As much as investors may be starving for yield, the situation would be even worse if inflation started picking up. Reid, Burns and Barker aren’t in crisis mode. They argue that sustained growth and a period of negative real returns for bondholders could allow this bubble of last resort to gradually deflate, but they also warn that investors should keep the worst case scenario in mind: a rash of government restructuring with no larger financial entity too bail everyone out. Mostly as an aside, the Deutsche Bank report also makes the interesting point that deflation used to be almost as common as inflation, but we haven’t had a year of global deflation since 1933. The historical data goes back far that we can take it with a grain of salt (my guess is that our data on inflation in the 1200s isn’t excellent), and the report doesn’t try to draw any strong conclusions but you have to wonder if the modern era of constant inflation isn’t connected to ever growing public and private debt and quick successions of asset bubbles.